Hedge laying is a traditional country skill that has been practiced for centuries. The original purpose was to create a stock proof barrier to prevent sheep, cattle and other farm animals straying from the land. The principles of hedge laying remain the same although styles may vary across the country. By laying a hedge you not only encourage new growth but create a living fence, alongside an excellent habitat for wildlife. This is an excellent way of regenerating an old and overgrown hedge without replacing it. 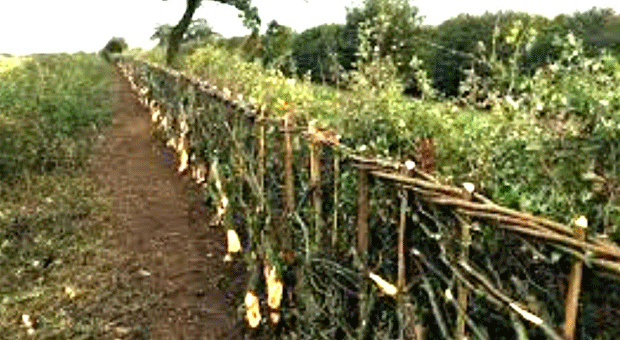 Hedge laying is seasonal and carried out between October and March when trees and shrubs are dormant and birds have finished nesting in the hedges. Once laid a hedge becomes a ‘timeless’ feature of the landscape that simply needs regular trimming to keep it in good order for decades – and infinitely more beautiful than a wooden fence.